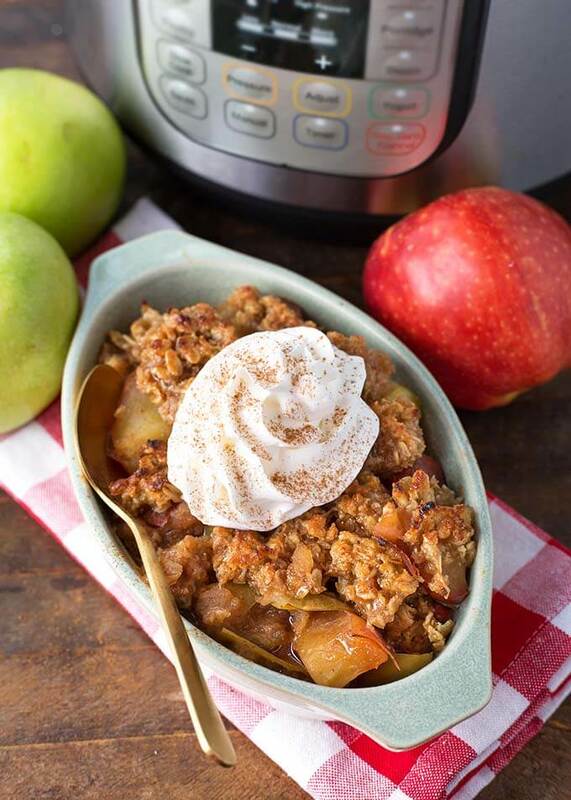 Instant Pot Apple Crisp is a delicious, easy to make Instant Pot dessert recipe. Tender apples with lots of sweet topping all cooked together in one pot. 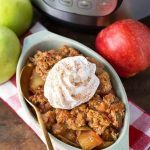 Pressure cooker apple crisp is an Instant Pot dump and start recipe that the whole family loves! Apples are one of the best fruits to cook with. They can go into sweet or savory recipes. I am from Washington, where apples are a big deal. We grow so many varieties, I don’t think I even know them all! We’re lucky to have them year-round. I have several recipes for Apple Crisp in my recipe box. I decided to borrow a little from a few of them and make my own version of Apple Crisp for the Instant Pot®. It may sound strange, but it is really very good! How can apple crisp made in the pressure cooker get crisp? Well, it doesn’t get crisp like in the oven, it is a little firm. But if you place it under the broiler for just a few minutes, it will crisp up on the outside, leaving delicious, sweet apple filling underneath! 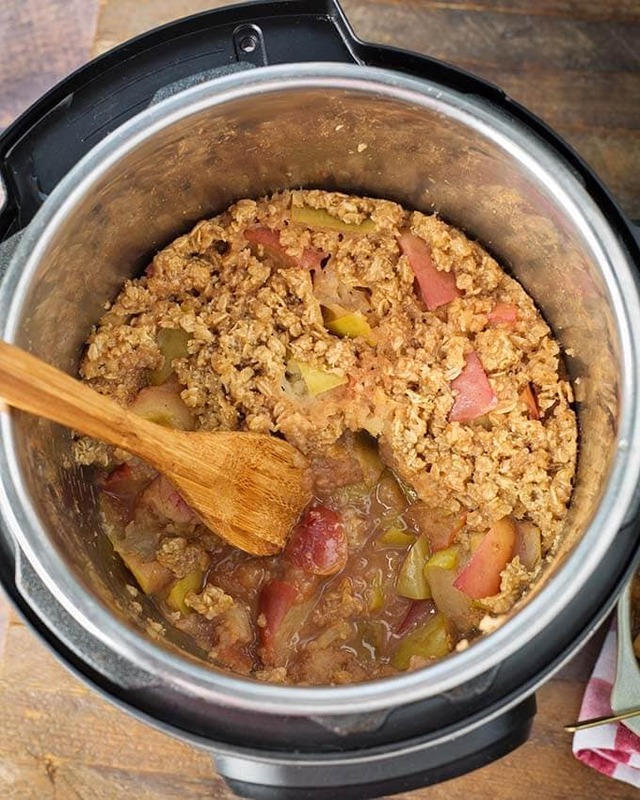 Which Apples are Best for Instant Pot Apple Crisp? Granny Smith apples are really good for cooking because they have a firmer flesh and don’t break down as fast as other varieties. They are tart so adding sugar and spices is important. I also use Gala, or another red variety because I like the flavor. You can use all one variety if you don’t want to use two kinds of apples. So the important question… Ice Cream or Whipped Cream? Vanilla ice cream for me! Though whipped cream is an acceptable alternative topping if you are out of ice cream. Use Old Fashioned oats if you can. They hold up better. Using brown sugar in the topping gives a richer flavor. 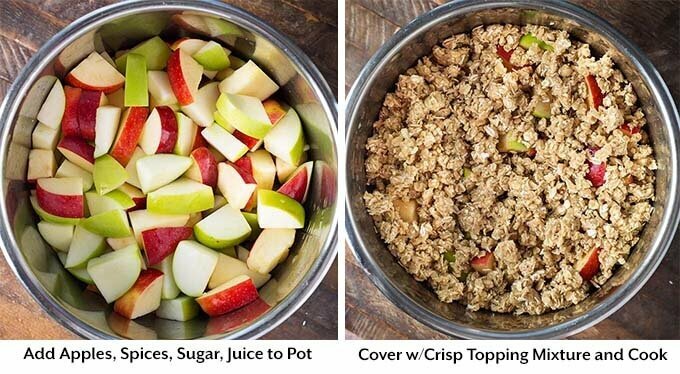 You don’t have to peel the apples. I never do. Some folks do. This recipe fits in a 6 qt or 8 qt pot. Decrease by 1/3 for a 3 qt pot. 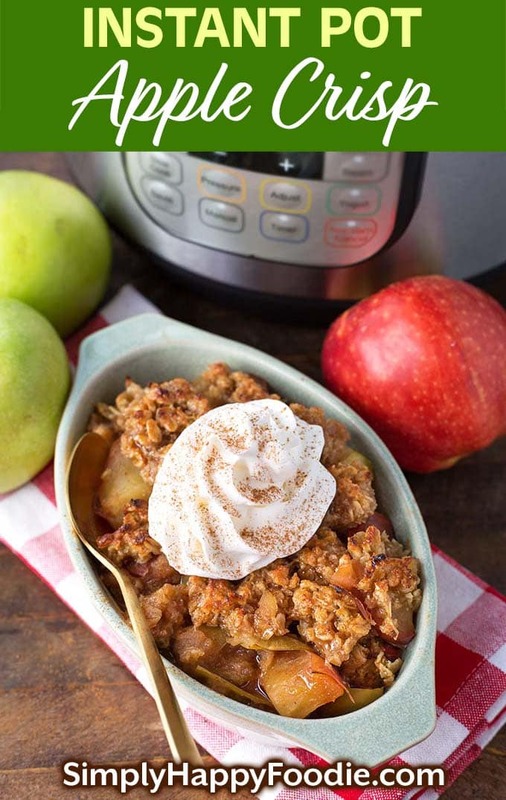 Instant Pot Apple Crisp is a delicious, easy to make Instant Pot dessert recipe. Tender apples with lots of sweet topping all cooked together in one pot. Wash and cut the apples into large chunks (about 1 1/2"). Add them to the pot. Add the lemon juice and toss the apples in it. Sprinkle the cinnamon, nutmeg, cloves, and sugar over the apples. Toss together. Add the vanilla and apple juice. Stir. Add the butter, flour, salt, brown sugar, and oats to a mixing bowl. Use a pastry cutter, or your hands to mix together until combined, and makes small clumps that hold together. Add the topping mixture to the pot, loosely, covering the apples. Don't stir. Place the lid on the pot and set the steam release knob to the Sealing position. Press the Pressure Cook/Manual button or dial, then press the +/- button or dial to select 1 minute. High pressure. The pot will take several minutes to come to pressure. When the cook time is finished, turn the steam release knob to the Venting position to do a Quick Release of the pressure. When the pin in the lid drops back down, you can open the lid. At this point, use oven mitts to remove the inner pot to a heat safe surface. Let the apple crisp stand for a few minutes to cool a bit thicken a little more. You can serve warm with vanilla ice cream or whipped cream. If you want to crisp up the topping, dish servings into oven safe dishes and broil on 450° for a few minutes. Alternatively you can transfer the entire pot of apple crisp to a baking dish and broil for a few minutes to crisp up the topping. So delicious! I made another Instapot apple crisp and it wasn’t as good as this one. I didn’t even bother broiling it. Perfect! Hi Heather, I’m so happy that my recipe worked for you! Thank you for your review!